Summer is all about fun, new friends, and exciting adventures. Community Sailing Center summer camps are designed to teach kids ages 6 through 17 the safety, skill, and joy involved in the life-long sport of sailing. 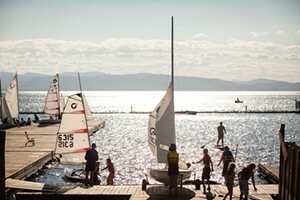 Organized by age group and led by certified instructors, camp options include sailing-only and multi-activity camps that blend sailing and another sport or hobby. Week-long camps take place throughout the summer with several sessions to choose from. The Community Sailing Center offers early drop-off/late pickup options as well as scholarships to accommodate each family’s needs.